Posted in Nutrition on March 26, 2019. Last modified on March 26, 2019. Read disclaimer. 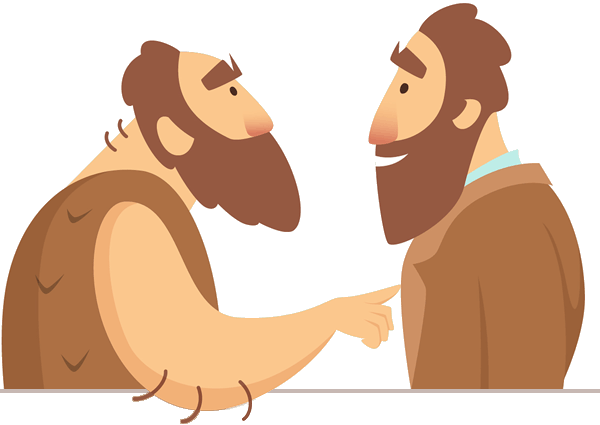 Here's something to consider when any of us start to think that we're a little bit 'special': Genetically and physiologically speaking, there is virtually no difference between us and our ancestors of 100,000 years ago. "How can that be? Certainly we must be more evolved! With the conveniences of A/C, refrigeration, supermarkets, jet planes, and internet, look at how far humans have come." Undoubtedly, our lifestyles have evolved tremendously since when our early cousin 'Grok' scraped by all day, every day just to 1) find a scrap of Woolly Mammoth meat left behind by a predator -- and 2) make sure that he, himself didn't become prey. After all, Grok's relatives would have to wait another 92,000 years for agriculture to be developed (around 8,000BC) and the industrial revolution to come about (circa 1800). But, as physical beings, we are basically unchanged. And, ironically, despite all our modern advances and conveniences, researchers believe that it's us, 21st century people, who live the more stress-filled -- and possibly less healthy -- lives. For most of us, food, shelter and safety may be of somewhat lesser concern -- but we have so many other things to worry about like relationships, our looks, our jobs, getting older, traffic, and finances. Plus, we have pollution, time pressures, crazy work hours and an almost unlimited list of other potentially harmful factors to manage or adapt to. While Grok had good reason to worry -- he was probably able to sleep soundly if he had a dry bed and a filled tummy. The stressors in our lives just never seem to stop. In addition, Grok was far more physically active. And, his caveman's diet -- if and when he could find food -- was almost certainly more nutritious and contained far less sugar, refined carbohydrates, saturated fats, tobacco and alcohol than what many of us are consuming. Some researchers believe that it's these radical and relatively recent stressors, along with our sedentary lifestyle and convenience-focused diet that may be at the root of many of today's most prevalent human health concerns; Diseases such as diabetes, heart disease, arthritis, obesity and some forms of cancer. From analyzing stress hormone levels, it appears that our bodies are chronically sending out modern-day 'danger signals.' This keeps our stress hormones elevated; which puts our immune system in a state of non-stop, high alert; which creates potentially harmful and chronic inflammation throughout our entire body. And it may be the cellular damage caused by this chronic inflammation that can eventually lead to many illnesses. "I refuse to eat bugs and live in a cave. Is there any hope for me?" Fortunately, yes! According to a paper published in the April 17, 2012 issue of Nutrition & Metabolism, "the human body possesses a strong capacity to recover from illness." 1) There are many relaxation techniques we can learn to reduce stress in the short-term and strategies to better manage it in the long-term. An approach that may offer nearly immediate relief is to simply question and reframe how we think about concerns in our lives; a practice called stoicism. 2) On the dietary front "If our genes are exposed to their 'original' environment by intake of an ancestral human diet, their function can recover rapidly. Research has shown that obese persons improve their blood markers after just 10 days following a Paleolithic diet consisting of fish, lean meat, fruit, vegetables and nuts . Similar results have been found in a study with aboriginals suffering from Diabetes II, who showed normalized blood markers after returning to their traditional lifestyle for seven weeks." But, fortunately, we probably don't have to resort back to eating bugs and woolly mammoth meat in order to dramatically improve our diet. Just going back just several generations to when meals included more plant-foods and whole grains with more fiber and less sugar may help to improve our health. 3) And, becoming even just a little more physically active (participating in as little as 20 minutes of moderate exercise such as fast walking) improves some health markers almost immediately.